If you would like to help us with the many worthy causes that we support on an ongoing basis and larger projects, then please click the “Donate” button below. Or you can log in to your Paypal and use the “send money” tab. Enter our Paypal address > hibs@stpats.club and use the”I’m sending money to family or friends“ tab. St.Patrick’s Branch will not be charged a fee. There is also the Bank Transfer option: simply pay the money into St. Patrick’s Branch of Hibernian Football Account using Sort Code – 08-92-99 Account Number – 65462861 00. If you are doing the transfer from Overseas, you may also need this info: International Bank Account Number – GB77 CPBK 0892 9965 4628 61, Bank Identification Code – CPBK GB22. All monies received will go to the Branch and don’t forget to include your name with the donation, so we know who to thank on our donations page, (although you may choose to remain anonymous if you wish). The Plaque to commemorate the founding of Hibernian F.C. was unveiled within the Church on Sunday 17 March by former Club Captain & Manager – Pat Stanton (who is also The St. Patrick’s Hibernian Supporters’ Branch Patron). In attendance were many Branch Members, other Hibs Supporters and representatives from Hibernian F.C. The hundreds of onlookers saw History being made this day and the event will be remembered by them for many years to come. A sad and little known fact was highlighted to us that Dan McMichael, Hibernian’s longest serving Manager, who was also Treasurer, Secretary and Physio is buried in an unmarked grave in the Eastern Cemetery, behind the Famous 5 Stand. Dan won the Scottish Cup in 1902 and the League in 1902/3. At a recent branch meeting, St. Pat’s Branch membership agreed that this is unacceptable and we are working towards getting a suitable memorial in place for him. Now that full funding is in place for the Founding Fathers Plaque, our recent efforts have been focused on this Branch Project and we are pleased to say that progress (the funding and authorisation) is well underway. To date, with the sponsorship money raised by Hugh Cockburn’s epic cycle run from London to Edinburgh (444 miles – please see the News Page for details) and from donations made by many fans, friends and relatives, the total is now in excess of £2000. A Branch Committee meeting will be held very soon, to discuss taking this Project forward and we will of course let you all know the details as soon as they are available. Many thanks once again and it’s still not too late to contribute any amount to this worthy cause. We are pleased to be able to announce that we have taken delivery of a magnificent headstone for the legendary Dan McMichael, who held office as Manager, Secretary and Treasurer of our great club. Dan was the last Hibernian Manager to lift the Scottish Cup in 1902 and Scottish League title 1902/3 season and although buried in the Eastern Cemetery, a stone’s throw away from The Holy Ground, it is a sad fact that Dan’s resting place has until now been unmarked, with no gravestone or inscription to him or his unique service to the Club. St. Patrick’s Branch of the Hibernian Supporters Association working hard with Hibernian supporters from near and far will now rectify this. It is only through the generosity of Hibernian fans that this has been made possible. St Pat’s wish to invite all Hibernian Supporters to join us, along with members of the Hibernian F.C. Board, the Hibernian Supporters Association and the McMichael Family, to this event. St. Patrick’s Branch Patron and modern day legend Patrick Gordon Stanton will unveil this stone in honour of Dan. The ceremony will take place in the Eastern Cemetery, Easter Rd, on Saturday 7th December at 11.30 am, prior to the home game against Patrick Thistle. Please look out for more details on here, the Hibernian F.C and St. Pat’s websites and make this a real Hibernian family celebratory occasion. A Hibs season ticket holder will take part in a charity bike ride from London to Edinburgh next month to raise funds to help buy a fitting memorial to club legend Dan McMichael, who was the manager when the Scottish Cup last sat in the Easter Road trophy room. Hugh Cockburn (57) who now lives in Sunderland will cycle from London to Edinburgh, starting off at Tower Bridge on Friday 3 May, arriving four days later in Holyrood Park. Money raised will go to the St Patrick’s Branch of the Hibs Supporters Club, to be used to buy a gravestone for the club’s longest serving manager. Dan McMichael played a special role in the history of Hibernian Football Club, and many fans were saddened when it was recently discovered that he had been buried in an unmarked grave in the cemetery behind the Famous Five stand. Born in Ireland in 1865, Dan was a ship’s carpenter to trade. He moved to Edinburgh in the mid-1890s where he lived with his brother-in-law, James ‘Judge’ Murphy. Although he had never played professional football, Dan had been a renowned sprinter in his younger day. 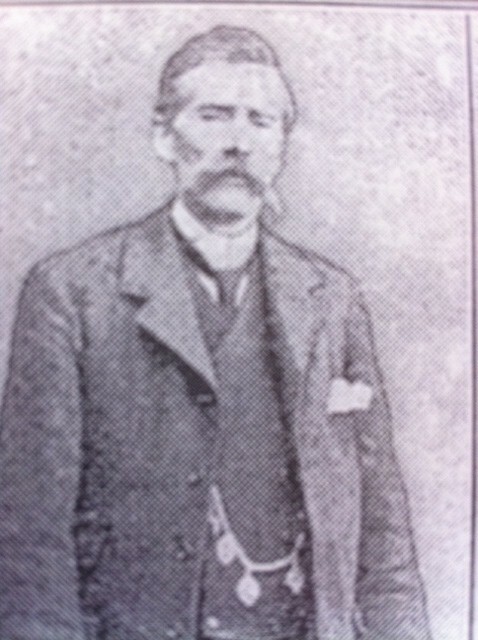 Described as a ‘tall, serious-looking man with a bushy moustache who was never known to speak harshly or ungenerously to anyone, Dan joined Hibs a few years later and filled every role from secretary to treasurer, manager to physio, with the highlight being that 1-0 win over Celtic in the Scottish Cup Final which Dan sportingly agreed would be played at Parkhead following a disaster at Ibrox which claimed the lives of 18 supporters at a Scotland v England game a few weeks previously. Dan’s Hibs then won the Glasgow Charity Cup beating Celtic 6-2 which meant that the Easter Road Trophy Room held four pieces of silverware, including the Rosebery Cup and the East of Scotland Cup. The following season Hibs won the League Title for the first time, finishing six points ahead of nearest rivals Dundee. Dan left his beloved Hibs for a short spell, but returned to lead the club for a further 15 years, after his replacement Phil Kelso left to join Arsenal. As well as being manager, Dan turned his hand to anything and did odd jobs around the ground when his office commitments finished. One day an English journalist visited Easter Road in search of material for an article, and he spotted what he assumed to be the groundsman painting the goalposts. When he asked where he could find Dan McMichael, the reporter was astounded when the ‘groundsman’ replied that he was talking to him. Whilst he kept the club in a prominent position, especially during the war, Celtic had overtaken Hibs as the preferred club of the Irish community in Scotland. The two rivals met again in the 1914 Scottish Cup Final, but on this occasion it was Celtic who emerged triumphant, winning 4-1 after a replay, although accounts of the first game suggested that Hibs had been on top and deserved to win. By the end of the war, Hibs finances were in a sorry state, and the Glasgow based media took great delight in making fun of the faded and worn Hibs jerseys which looked more yellow than green. Their performances were such that an Easter Road chip shop owner, Jock Ward, had taken to offering fans free fish suppers if the team won at home. His profits were safe as the campaign saw just three win in 19 matches. Dan’s story ended tragically in 1919 when he was one of 100 million victims worldwide of Spanish flu possibly having picked up the infection working in the docks at Leith. He collapsed on his way home from Brockville on February 1, 1919, after a 1-1 draw with Falkirk. Taken home to be with his wife, Jane, at 247 Easter Road, he was confined to bed, where he died peacefully five days later. His funeral was well attended and Hibs directors paid for a wreath in the shape of a broken harp, reflecting the Irish heritage of the manager and the club. Hugh told the Irish News Review: “I joined St Pat’s (Supporters Club) just after it started and have met some great people. I cycle to and from work and have done some charity bike rides before, and I was booked to do this one from London to Edinburgh, so when I heard about the campaign to fund a memorial for Dan McMichael, I volunteered to do the ride to raise money for the cause. I think it’s unbelievable that he is in an unmarked grave considering what he did for our club.